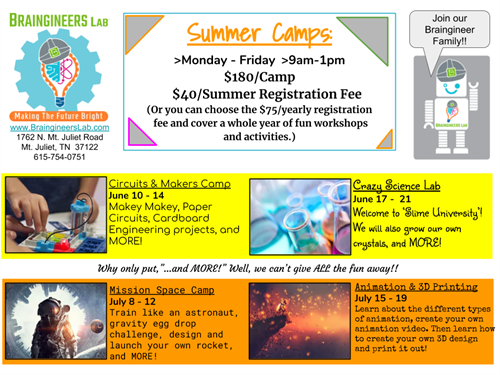 Makey Makey inventions, Paper Circuits, Cardboard Engineering projects, and much More! Slime University: Unicorn slime, magnetic slime, fluffy slime; Grow your own Crystals and More! Train like an astronaut, Gravity egg drop challenge, design and launch your own rocket and More! Learn the different types of animation, create your first animation video, and design your own 3D creation using Tinker Cad. Don't miss out on the fun. We know you will be glad you came and joined our Braingineer Family. Take the Mt. Juliet Exit off of Hwy 40. We are located north of Hwy 40 on N. Mt. Juliet Road across from Whitts Barbeque.